Got the Instant Pot? Now do more with it with these most useful accessories for your Instant Pot. From cheesecakes, to egg bites to a variety if one-pot meals with the pot-in-pot cooking method. You can do it all in the Instant Pot. As I said in my previous post, I love my instant pot. If you have not found it yet, check it out. I use it to prepare pretty much every meal I cook. Yes, there are some things that you cannot make in it, such as the Indian bread or roti. But other than that, a lot of recipes can be easily converted into pressure cooking. See some recipes here. 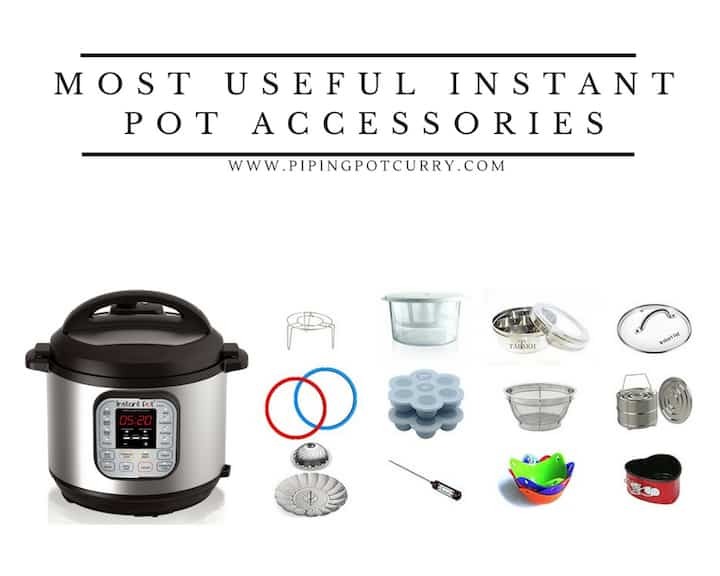 If you have already make the instant pot purchase, here are some interesting accessories to consider. I have not used all of them, but they are highly regarded in the instant pot community. I also recommend to only buy accessories if you are going to use them often. Look at your own kitchen before you order any accessory, you might find some of them or a useful variation available right there. Click the link or image to buy the accessory. If you plan to cook multiple things in the instant pot, or rather any pressure cooker at once, then these stackable steel inserts will be very useful. In Indian cooking, we have been using these inserts with the traditional stovetop pressure cookers for as long as I can remember. These trays have recently become a popular accessory to make egg bites. I ordered them and just see so many uses for these. Originally made for storing baby food in small quanity, but aren’t we all great at finding other uses for it. Remember the spice box mom used all through growing up (if you grew up in India), reuse that as a great way to make mini batches of yogurt. Also, this ring keeps some of the odor of the food cooked in the pot, so you might want to use a different one for sweet and savory items. Especially with Indian cooking where we use a lot of spices, the silicone ring tends to hold the odor much more. I recommend to get the one from the Instant Pot brand. It sounds obvious, but there are many brands out there, and it is best to get the one for the instant pot that we are all crazy about. If you want to see the food being cooked when slow cooking, then you can use a glass lid (not in pressure cooking mode). Alert: you may have this in your kitchen, so look before you buy. If you want to cook multiple things at the same time in the instant pot, consider this rack stand. You can cook one thing in the main pot and one on top of this rack in a glass or steel bowl. This seems like a useful accessory, and the easiest thing to use the instant pot for…steaming vegetables. If you are eating healthy, then steaming broccoli, sweet potatoes, asparagus, etc could be great. I have used other steel sieve’s for steaming veggies (you remember the one used to sieve flour). That works great too. Another popular steaming basket is this one below. The advantage with this one is that it is expandable, so it can fit many size pots. These stainless-steel tongs are very useful if you do pot-in-pot (PIP) cooking frequently. You might not have heard about or seen these tongs much, but they are an essential part of every kitchen in India where most of the cooking is done in steel pots that don’t have handles. When I started sharing videos doing PIP cooking in the instant pot, I got many questions from people who were interested in these tongs. So I am added them to this list of useful accessories. See this Madras Lentils video to find how I use these tongs. If you want to delve in to making cakes in the instant pot, try this cake tin. It has to be the right size to fit in the instant pot. 6″ or 7″ cake tins would fit in the instant pot. There are also multiple shapes, a heart shaped cake? Valentines just passed by, so you might want to show some love. Another one that is very popular is Fat Diddio Cheesecake pan 6″ by 3″. I love this pan for making mini cakes. It fits perfectly in my instant pot and air fryer. I use this baking pan to make this delicious Spinach Artichoke Lasagna. If you want to make mini-chocolate cakes in the instant pot, these could be your friend. They look great for serving and are the perfect portion size for one. I feel the need for this so many times. As most of you, I don’t love to wash utensils. But when you are making multiple things for dinner or have guests coming over, and you need the instant pot for 2-3 of them. At this time, a replacement pot would come in handy. If you like poached eggs, they come out great in the instant pot. You can use these silicone poachers or use small steel/glass bowls to make poached eggs. If you love yogurt like we do, you might want this yogurt strainer to make thick creamy greek yogurt. If you make yogurt regularly and are struggling with getting it right. The most probable reason may be adding the culture when the milk is cooled to the right temperature. I use this digital thermometer to check the temperature. This is also popular to check temperature while cooking meat. 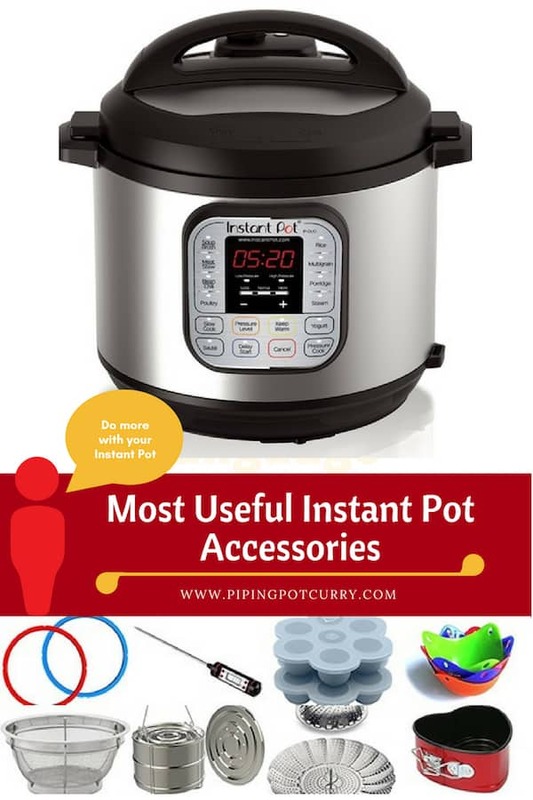 There are lots of accessories out there for the instant pot. However I always recommend looking around your kitchen to find the existing things you can use in the instant pot – glass bowls, steel bowls, ceramic bowls. For eg. I use the pyrex glass bowls for making yogurt and oats, which works perfectly. I can also just eat my oats in them. Here is an easy link to the list I made on Amazon for all the above accessories. To start using your instant pot of Indian cooking, check out the Indian Spice Pantry. I am about to purchase my first Instant Pot (I just irrevocably broke my stovetop pressure cooker) and am looking at a few accessories that I might need. Your post has been very helpful however I noticed you use a pan gripper in your videos that is not listed here. Would you be able to share brand info or a link? Most of the gippers I have found are plastic and don’t look very sturdy whereas the one you use has nice long handles and appears to be all metal. ~Thanks!